Subiaco Floreat won their sixth flag on Sunday. 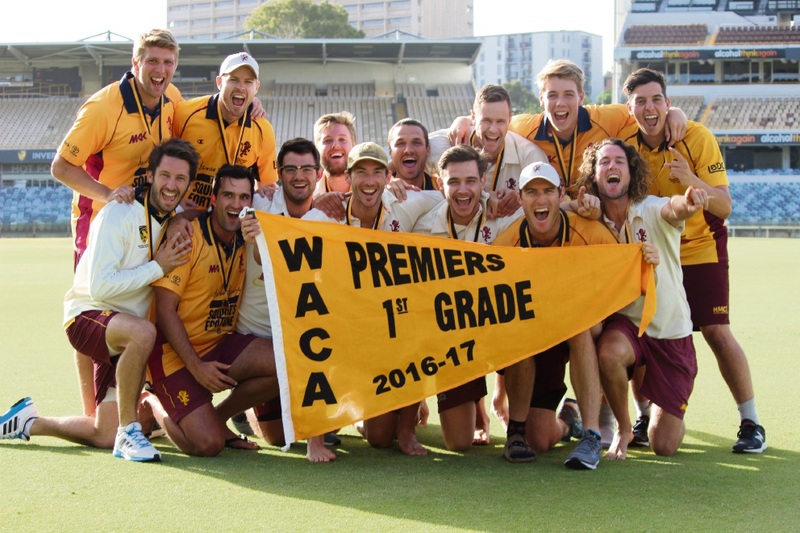 SUBIACO Floreat clinched its sixth Premier Cricket First Grade premiership after a thrilling two-wicket win over Joondalup at the WACA yesterday . Lions skipper Chris Hansberry proved the match-winner with a chanceless 74 not out, in an unbeaten 90-run ninth-wicket stand with Andrew Holder, as the duo closed out an improbable victory for the third consecutive match. In pursuit of Joondalup’s 284, Subiaco Floreat appeared beaten at 8-196 before the pair’s heroic partnership. Hansberry and Holder shared Player of the Match honours, after also taking three and six wickets respectively with the ball in restricting Joondalup on day one. At 8-196, Holder and Hansberry came together; appropriately, both were there at the end. Hansberry played a true captain’s innings, putting away boundaries while patient in defence, as his Subiaco Floreat side pulled ever closer to 284. Fittingly, Hansberry hammered a boundary backward of point to seal a famous victory for the Lions, with Holder stoic with 13 not out. Remarkably, the pair combined for 218 runs throughout the finals, earning Subiaco Floreat the premiership.